Actor Alan Rickman, known for films including Harry Potter, Die Hard and Robin Hood: Prince of Thieves, has died at the age of 69, his family has said. The star had been suffering from cancer, a statement said. He became one of Britain's best-loved acting stars thanks to roles including Professor Snape in the Harry Potter films and Hans Gruber in Die Hard. Harry Potter author JK Rowling led the tributes, describing him as "a magnificent actor and a wonderful man". She wrote on Twitter: "There are no words to express how shocked and devastated I am to hear of Alan Rickman's death." 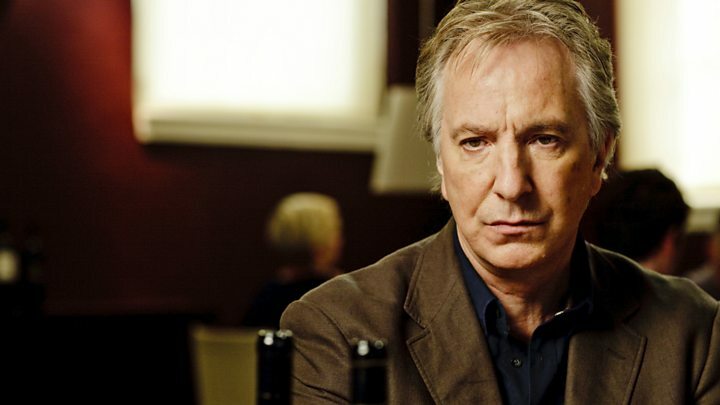 She added: "My thoughts are with [Rickman's wife] Rima and the rest of Alan's family. We have all lost a great talent. They have lost part of their hearts." Emma Thompson, who appeared with Rickman in productions including Love Actually and was directed by him in The Winter Guest, said he was "the finest of actors and directors" and "the ultimate ally". She wrote in a statement: "Alan was my friend and so this is hard to write because I have just kissed him goodbye. "What I remember most in this moment of painful leave-taking is his humour, intelligence, wisdom and kindness. "His capacity to fell you with a look or lift you with a word. The intransigence which made him the great artist he was - his ineffable and cynical wit, the clarity with which he saw most things, including me, and the fact that he never spared me the view. I learned a lot from him." She added: "He was, above all things, a rare and unique human being and we shall not see his like again." Announcing his death on Thursday, a family statement said: "The actor and director Alan Rickman has died from cancer at the age of 69. He was surrounded by family and friends." Harry Potter star Daniel Radcliffe said Rickman was "undoubtedly one of the greatest actors I will ever work with". He wrote on Google Plus: "Working with him at such a formative age was incredibly important and I will carry the lessons he taught me for the rest of my life and career. "Film sets and theatre stages are all far poorer for the loss of this great actor and man." Sir Michael Gambon, who appeared with Alan Rickman in Harry Potter as well as on stage, told BBC Radio 4 he was "a great friend". He added: "Everybody loved Alan. He was always happy and fun and creative and very, very funny. He had a great voice, he spoke wonderfully well. "He was intelligent, he wrote plays, he directed a play. So he was a real man of the theatre and the stage and that's how I think of Alan." Director Ang Lee, who cast Rickman opposite Kate Winslet in 1995's Sense and Sensibility, called him a "brilliant actor… a soulful actor… [and] a great human being." Actor Richard E Grant wrote on Twitter: "Farewell my friend. Your kindness and generosity ever since we met in LA in 1987 and ever since is incalculable." TV star and Bafta ceremony host Stephen Fry wrote: "What desperately sad news about Alan Rickman. A man of such talent, wicked charm and stunning screen and stage presence. He'll be sorely missed." Actor David Morrissey also paid tribute. He said: "So sad to hear the news of Alan Rickman. A wonderful actor and lovely man. Tragic news." The London-born star began his career in theatre, including with the Royal Shakespeare Company, before winning roles in TV dramas like Smiley's People and The Barchester Chronicles in the 1980s. His performance as the manipulative seducer the Vicomte de Valmont in Les Liaisons Dangereuses on Broadway in 1986 brought him the first of two Tony Award nominations. It also brought him to the attention of Die Hard producer Joel Silver, who offered him his film debut as a result. Media captionFilm critic Jason Solomons: "He had a gift for being sneeringly withering"
He went on to become best known for playing screen villains - including the Sheriff of Nottingham in 1991's Robin Hood: Prince of Thieves, for which he won a Bafta award, and Judge Turpin opposite Johnny Depp in 2007's Sweeney Todd: The Demon Barber of Fleet Street. But he showed his gentler side in films like 1990's Truly Madly Deeply, in which he played Juliet Stevenson's ghost lover and which also earned him a Bafta nomination. Further Bafta nominations came for his roles as Colonel Brandon in Sense and Sensibility and the calculating Irish politician Eamon de Valera in 1996's Michael Collins. The following year, he won a Golden Globe for best actor in a miniseries or television film for the title role in Rasputin: Dark Servant of Destiny. Other film credits ranged from Tim Robbins' 1992 political satire Bob Roberts to Richard Curtis's 2003 romantic comedy Love, Actually, 1999's sci-fi spoof Galaxy Quest and the voice of the Blue Caterpillar in Tim Burton's Alice in Wonderland. He also moved behind the camera in 1997 directing Thompson and her mother, Phyllida Law, in The Winter Guest. Two years ago, he also directed period saga A Little Chaos, in which he co-starred with Kate Winslet. Meanwhile, he continued to be a major presence on the stage in London and New York. Another Tony nomination came for Private Lives in 2002, in which he appeared opposite Lindsay Duncan on Broadway following a transfer from London. He recently revealed he had married Rima Horton in secret last year. The couple had been together since he was just 19 and she was 18.